Now as in years gone by, fillings are a real mainstay of general dentistry – frequently prolonging the lives of teeth and preventing the need for more complex treatment. But not everything remains the same. 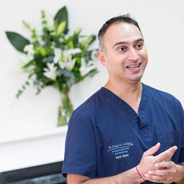 People now recognise the importance of aesthetic considerations, and more people than ever want their smile to be as natural-looking as possible. This has led to a surge in popularity for so-called ‘white fillings’, made of a composite material which can be closely matched to the natural colour of a patient’s teeth. At St Peter’s Lodge Dental, we recognise that a filling should look right as well as doing its job to help maintain dental health. Many people find that white fillings help them to talk, laugh and eat with greater confidence, safe in the knowledge that they won’t be displaying dark coloured-fillings when they open their mouths. If you would prefer white fillings to traditional amalgam, we’ll be happy to help you – whether you’re looking to replace existing fillings or simply want to choose composite resin for any future dental work. ‘White’, or more accurately tooth-coloured fillings are made from a composite resin. This is a tooth-coloured plastic mixture filled with glass (silicon dioxide), first introduced in the 1960s. Originally only used for front teeth because of their softer nature, modern improvements to their composition mean they are durable enough to be used for teeth of all kinds.Your dentist will carefully bond them into your teeth using adhesives which will support the remaining structure of your tooth.